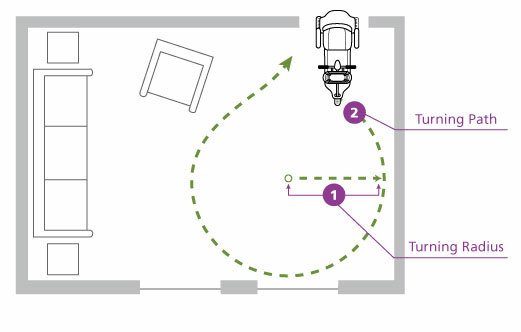 Turning Radius: The turning radius is the minimal space needed to execute a 180° "U turn". Scooter turning radius can be found listed in the Details & Specs tab on the scooter page under the image. Turning Path: The turning path is your turning direction and the space needed to complete an uninterrupted turn is determined by multiplying your turning radius by two. SpinLife recommends adding a few extra inches onto the measurement in order to make turning safer and easier within your home. If you find that a scooter can't turn in the places you need it to because the turning radius is too large, you may want to consider a power wheelchair. 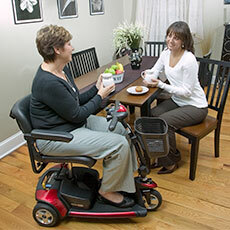 Power wheel chairs have a turning radius as tight as 20 inches, which means they can turn in a 40" space..